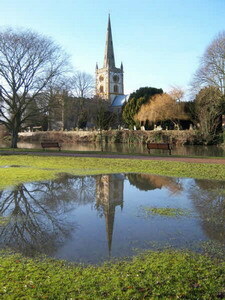 Stratford-upon-Avon is a town on the River Avon in south Warwickshire, England. In 2001 the town had a population of 23,676. 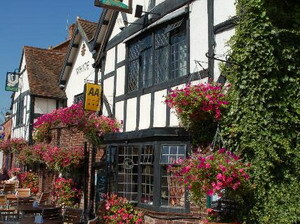 The town is the birthplace and deathbed of William Shakespeare and because of its Shakespearian connections the area is a popular tourist destination, receiving about three million visitors a year from all over the world. The local district is named after the town, but the district is called Stratford-on-Avon, whereas the town is officially called Stratford-upon-Avon. Locally, the town is known as Stratford for short, and as such can be confused with the Stratford in the London Borough of Newham. The town is located on the Avon, on the banks of which stands the Royal Shakespeare Theatre, home of the Royal Shakespeare Company. The RSC also runs two smaller theatres, the Swan, which is modelled on an Elizabethan theatre, and The Other Place, a black box theatre. There is currently also the temporary Courtyard Theatre, opened in July 2006, which will become the home of the RSC while the RST is being refurbished, beginning in mid-2007. Early in 2006 The Other Place temporarily ceased to exist because the space it occupied is being used as the Courtyard Theatre's foyer space, cloakroom, bar areas, dressing room and rehearsal space. The Other Place will be reinstated after the RST refurbishment is complete and the Courtyard Theatre is dismantled. 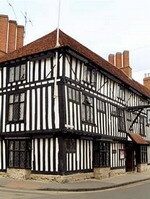 Other tourist attractions within the town include the Shakespeare Birthplace Trust and two contemporary buildings, Hall's Croft (the one-time home of Shakespeare's daughter, Susannah) and New Place, which stands on the site of an earlier house originally owned by the playwright himself. Also within the town is Holy Trinity Church, where Shakespeare was baptised and is buried. This splendid grade II listed Georgian building steeped in it’s own history and close to 180 years old, offers intimate lounges and individually decorated modern bedrooms. Our fantastic location, just 3 minutes from the main tourist attractions and right in the centre of the town, is perfect for relaxing and enjoying our historic town and yet ideal for business visitors with five great conference rooms and free WiFi throughout. Our reputation for a warm friendly welcome is complemented by impeccible service and superb food from our extensive restaurant, lounge and room service menu’s. Fresh, local produce is paramount to the quality we offer throughout the hotel and makes the Best Western Grosvenor stand out from the crowd. Set in the landscaped gardens, this superb property is an ideal place to enjoy the beauty of the surroundings. 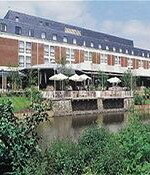 Situated on the River Avon, Holiday Inn Stratford Upon Avon is 20 miles away from the Birmingham Airport and the NEC. This property is near the Shakespeare House, Charlecote Park National Trust as well as the amazing Warwick Castle. All the 259 bedrooms are tastefully designed and elegantly decorated as well as facilitated with an array of modern amenities. Overlooking the beautiful gardens, the Riverside Restaurant offers a traditional cuisine. After a tiring day, unwind at the cosy bar, which offers coffee or tea, light meals as well as a full range of beer, wines and spirits. During leisure, you can workout in the state-of-the-art gymnasium, have a bracing dip in the swimming pool, re-energise your body in the jacuzzi, pamper yourself at the sauna or relax at the solarium. Offering comfortable accommodation and quality services, this property is an excellent choice for those who want to explore Stratford. Situated in the centre of town, the Falcon Hotel is just a kilometre from the Stratford Train Station, while the airport is 38 kilometres away. The hotel boasts comfortable guestrooms that are beautifully decorated and comes with all the contemporary amenities. Offering a pleasant and comfortable atmosphere, the bright and spacious onsite restaurant is a perfect place for a rendezvous or a family gathering. Business travellers can avail the conference facilities for organising their official meetings and seminars in the comfort of the hotel. At leisure, you can relax in the lobby or explore the surrounding areas. 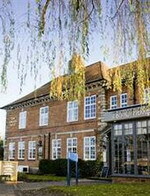 The Macdonald Alveston Manor Hotel Stratford, with its beautiful gardens is just a short walk from the centre of Stratford and the Royal Shakespeare Theatre. 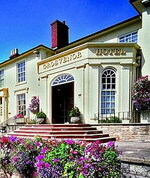 Many public areas of the hotel are located in the Manor House, parts of which date back to the 16th century. This hotel offers 113 comfortable rooms equipped with all necessary amenities. For your convenience, this hotel is only 25 miles from Birmingham International Airport and close to nearby towns like Oxford, Warwick and London. The Restaurant at Macdonald Alveston Manor has long been recognised as one of Stratford-upon-Avon's premier venues, providing a la carte and other menus in a warm and intimate atmosphere. The Manor Bar not only offers a full range of drinks including a great selection of beers and wines but also is a great location to meet friend and relatives. Other facilities include banquets, spa, sauna a swimming pool. Set on the South side of the River Avon, the Macdonald Swan's Nest Hotel is just a 5 minutes walk away from the town's charming shops and many Shakespearian buildings. With a frontage on the River Avon, the Macdonald Swan's Nest is the perfect location for any event and to visit the surrounding Cotswolds. The hotel has 67 ensuite guestrooms, all tastefully designed in a contemporary fashion with many overlooking the River Avon or the garden. You can also dine at the in-house restaurant serving local cuisine. The Macdonald Swan's Nest provides an ideal venue for conferences, banquets and private dining that can accommodate up to 150 delegates. 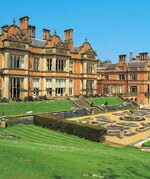 The Menzies Welcombe Hotel Spa & Golf Club in Stratford-upon-Avon stands in 157 acres of beautiful grounds. Originally built in 1866, the Jacobean-style house combines the traditional charm of the oak panelled lounge and magnificent four-poster suites with the contemporary décor of the garden rooms and luxury spa. At our Stratford-upon-Avon hotel you can dine in the ornate award-winning restaurant complemented by outstanding views over the beautiful Italian gardens and water features; relax in the impressive lounge with it’s inviting sofas and grand open fireplace or stroll through the beautiful, landscaped gardens with stunning views over the open countryside beyond. This luxury Stratford-upon-Avon hotel offers some of the finest leisure facilities in the heart of England; the outstanding 18 hole championship golf course; the all weather tennis courts and the luxurious spa, with its impressive indoor swimming pool, external vitality pool and range of thermal experience rooms and treatment rooms. The Stratford Manor is set in 21 acres of landscaped, tended grounds, you can feel the peace and serenity of the countryside work its magic, and enjoy the quintessentially English scenery, far from the madding crowd. 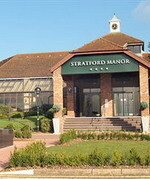 Yet 5 minutes away lies both Stratford and the M40 connecting you to the Heart of England and culture galore. Our bedrooms are sophistication on legs. The warm, subtle tones of the décor are calming and stylish rolled into one, and the little touches make them feel all the more indulgent and glamorous. Diners are spoiled for choice with the award winning Shakespeare restaurant offering dishes with local and seasonal influences. For something more relaxed an all day menu is available in the Terrace Bar or on the patio. Our leisure club marries energetic workouts in the pool, gym and tennis courts with relaxing chill outs in the sauna and steam room. Then there’s our service. Friendly, attentive, genuine; our staff can’t do enough for you.